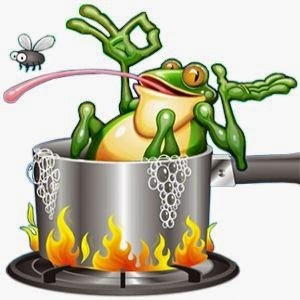 Have you ever heard that if you throw a frog into boiling water it will jump right out because it notices the immediate change in temperature, but if you start with cool water and slowly heat the water the frog won't even notice? So I have a segment in today's profile I call, "Boiling the Frog", where during the 6 minutes we increase resistance a total of 4 times during a standing climb, and each time we transition back to a seated climb for a bit longer time. If you loaded it heavily to begin participants might give up early, or they might not load it enough which each opportunity. Push them to a resistance they didn't think they could do by letting it sneak up on them. Other take aways, if you haven't tried projecting the ride profiles for your class, you're missing a great tool. I consistently hear from my participants that it helps to motivate them because they can gauge when the next break is so that they know they can push hard without worry of holding something in reserve. I'm still shaking from watching the cobbles.